Following in an Earth Day tradition pioneered this year in Santa Barbara, a pair of student activist campaigns teamed up to educate and mobilize the University of California, Santa Barbara community about the future of campus energy policy on Monday, April 22. 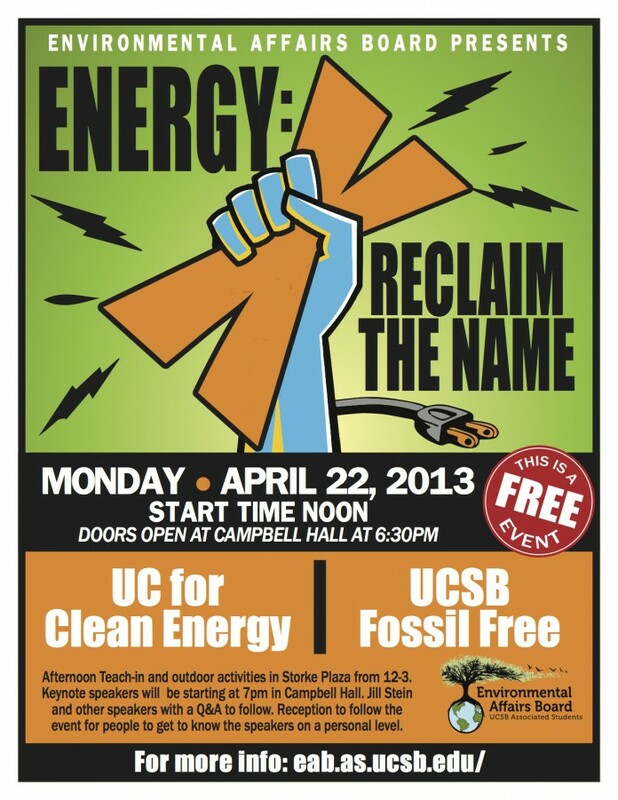 UCSB Fossil Free and UC for Clean Energy (UCCE), two distinct campaigns birthed by the local Environmental Affairs Board, hosted “Energy: Reclaim the Name,” which included a teach-in demonstration in Storke Plaza and a series of lectures in Campbell Hall aimed at giving students the tools they need to build a social movement to confront climate change. The daytime teach-in consisted of a series of short, open-mic speeches by students and faculty on the politics and implications of climate change, punctuated by musical performance by the local band, “Yonder.” The evening event in Campbell Hall, kicked off with a spoken-word poem by Ryan Yamamoto; featured talks by David Auston, executive director of UCSB’s Institute for Energy Efficiency; Strela Cervas of the California Environmental Justice Alliance; and Jill Stein, the Green Party’s 2012 Presidential nominee. The event carried a hopeful and informative spirit intended to galvanize more students into action on the issues of climate change and sustainability at UCSB. UCSB Fossil Free and UCCE have indeed been asserting their power on campus with a progressive new vision and two-pronged strategy for energy-use sustainability. In step with a national divestment campaign, UCSB Fossil Free proposed a resolution two months ago that unanimously passed the UCSB Associated Student Senate demanding the UC Regents terminate their financial investments in fossil fuel industries. Meanwhile, UCCE has published a detailed proposal for the UCSB campus to become 100 percent clean energy powered by 2020. According to Emily Williams, EAB state-wide affairs coordinator and lead organizer for UCSB Fossil Free, a dual strategy targeting investments and providing local energy alternatives is imperative to achieving sustainability. For such projects to be fully realized, however, they will need more popular support and action from the student body. For Chellsee Lee, clean energy chair for EAB and founder of UCCE, the purpose of the teach-in was precisely that—to engage more students by showing their intimate involvement in these issues. For LeQuesne, stemming further climate change depends on building a militant student movement. A recurring theme throughout the day was the linking together of environmental and social justice causes. In her teach-in speech, Williams offered an expanded definition of “sustainability” that added the pillars of social equity and fair economics alongside a healthy ecology. Similarly, in Stein’s keynote address, she offered that the multiple crises we face today—economic, political, and ecological—have converging solutions, such as a “Green New Deal” that would simultaneously transform our economy and our relationship to the nature. The loud and clear message from the day’s events was one of people’s power.